Entities that came to dialogue: Master Ruanel and Master Morganel. Ruanel: How is it going Manuel, how are you? Interlocutor: How are you Master Ruanel? Ruanel: Very well, trying to make a kind of philosophy, so-to-speak, as you say in the physical plane. I am somehow trying to intention and communicate with H, but it appears that He is caged in some apartment. Interlocutor: How is it that thing he is caged? Ruanel: ...I will talk to you. Interlocutor: Is there something you want to tell us, Master? Ruanel: No, no, no, I will simply philosophize. I imagine that there is a huge factory. I imagine there is a huge factory, which is divided by sections and it’s a factory that produces a lot and it has surplus, let’s say that instead of steel sheets, it gives teaching. Then, later on it grows in departments. Those departments somehow absorb those teachings and instead of obtaining profit, they stay quiet with those teachings. The same thing happened when I was incarnated. When I was incarnated I left “powdered gold" as you would say in the physical plane. But now I tell you that that gold could germinate, Yes? Imagine that the powdered gold were a series of seeds and the golden trees would grow with golden leaves so that everybody could be well. We are speaking about a materialistic world, but don't take materialism as a bad word, let’s take materialism like a net that help each other, Yes? Are you following me? Interlocutor: Yes, go on, Master. Ruanel: But many people instead of sowing those golden seeds, in that factory, what they do is to keep their bags instead of sowing, because they don't know how to sow. Because in the imaginative-philosophical world of mine one sows studying. In the philosophical world of mine one sows by committing, in the philosophical world of mine those golden seeds are sown by having perseverance, investigating, growing up, for the same indifference - or maybe, I correct myself to not confuse this vessel - not indifference, conformism; the conformism makes that the alleged golden leaves go withering like the leaves in autumn and then, later on, there is nothing more to sow because those leaves dried off, figuratively speaking. Do you understand me? Interlocutor: Yes, it is a metaphor that can be understood. Ruanel: ...but they don't have eagerness. But they don't have enthusiasm and I speak in a philosophical way because as a Spirit of the plane 5, I know that in the physical plane there are many people likely to be offended and so I explain it in that way. For that reason the dear Master Jesus spoke in parables. I simply wanted to comment that and well, thank you Manuel for listening to me. Interlocutor: Thank you, Master Ruanel. Thank you. Morganel: I give thanks to Eon for being here due to his Free Will. My name is Morganel, I have already been in previous opportunities with this investigative eagerness that gives me passion. As the sublime Johnakan already said many times, the language is poor compared to the spiritual concept because the word "passion" it’s not the exact word since it can sound like an egotistical slave of investigation and it is not like that at all, simply that we take "passion" as a synonym of "enthusiasm" although it is not exactly like that either, but let us take it in that way. This means that I’m joyful investigating, it gives me joy being able to give the tools to others so that they also grow up, so that they are nurtured of that information, so that they acquire knowledge and later on they can apply it and so they be capable to also grow up in wisdom. Because one cannot grow up in wisdom if knowledge is not applied correctly. We cannot ascend spiritually - as you say in the physical plane - if we don’t take advantage of the lessons we have to learn. We cannot take a step to the Path of Light, if we are seated at one side of the road - always copying me from the physical language, Yes?- And many times I perceive that many of those, who are in the Path of Light, are at one side of the road because they consider that they have enough with what they have. They feel satisfied with that small treasure when in fact the Path of Light is not a treasure. It was said by the Sublime Johnakan already in an aphorism: "The goal is the quest." This means that if you have reached a certain level and if you feel happy with that level, it is truly because you have not learned anything. You have to go on with that eagerness searching another level because the true goal is to keep looking for, I mean, to keep learning, to keep ascending, to keep nurturing you. However many people feel satisfied with a certain level and in that level they feel well, since that level yield profits for them, it gives them fruits and it would give the impression that they forget to be useful to others, it would give the impression that they feel happy with the goal and that goal doesn't allow them to see the quest. Translated as "tree and forest", if you understands the paradox, yes? The goal doesn't allow them to see the quest. Some time ago the dear Master Ruanel spoke in a philosophical way about a factory that had surplus of products, which offered elevation and that many who put annexa kept those fruits and with those fruits they felt happy, forgetting, or rather leaving aside the true origin of the factory, which is the power to give. I coincide with that. We know that the physical plane is a gravitational well. It is another of the sentences that through this vessel Johnakan said. And we know that the physical plane also has fishhooks in shape of problems, in shape of obstacles; the physical plane has needs, or rather; it creates needs in the 10% incarnated and many times those needs are a blindfold over the eyes of those who have the lucid sight when they can visualize their mission. Those same needs create a fog that prevents them, somehow, to see the true Path. Then, many beings are satisfied in that conformism, even those who stretch out their hands to help others and they feel happy saying: "Today I helped two people. I feel happy. I have fulfilled my day." And that makes me remember - because I embodied many times in this world Sun 3 - to those religious parishioners, who are seated on a bank of a church and they have prayed a psalm and they feel already happy with that day. Interlocutor: Yes, it is correct. Many times I have wondered about it. Interlocutor: Yes, on that matter, I have been thinking too much. Morganel: ...and what you were thinking it’s true; we won't reach the Big Crunch in equality of conditions. Interlocutor: Then, do you ratify it to me? Is it correct? Morganel: Yes. I confirm it. We won’t reach it in equality of conditions, otherwise we would fall in the same mistake of many religious currents of the present time that use - without quotation marks - they use the figure of Jesus to say: "It doesn’t matter, if you repent in the last day, all your sins will be forgiven." Interlocutor: Yes, but I agree that you clarify that. Morganel: ...it is as if you had - hypothetically speaking - a bank account in which you have a small amount of money, but hypothetically, since you are the bank manager's friend, - even in real life being the manager's friend this would not happen, for that reason I say “hypothetically”- Then, it is as if you could withdraw certain amount of money daily and you could withdraw money over and over again and so you would have a debt, obviously a gigantic debt, and a bank account would be in red numbers, a negative account. Then, if you had few days to disembody, you deposit some cents, some coins and according to the approach of these religious people, the fact of repenting and deposit some coins already covers all the debt you had in red numbers. Something like that does not happen in real life. And it doesn’t happen in the spiritual world either. 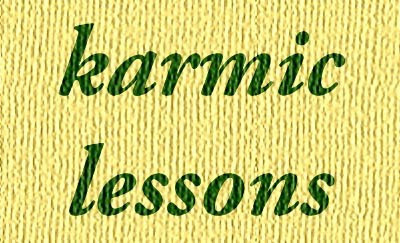 For that reason the Karmic lessons exist, if you have had a life in which you have committed dozens or hundreds of hostile acts, because you were an executioner, a frightful emperor, a terrible warrior, who didn't have pity on women or children, and you are not going to reverse karma in that same life, if suddenly, you forgive the life of a young man, or if you build a temple or a mosque or a synagogue, you are not going to reverse your karmic lessons, because I don’t even know if you will have enough time in the next life to reverse those karmic lessons because you would have many things to learn yet; compassion, pity, understanding, the understanding of the other and many other virtues. This, with regard to one life or two lives. Then it is not that during many years you can withdraw limitlessly from that bank account and then you deposit some cents and you are already covered, because it would be – amusingly, ironically - like those who commit a tremendous hostile act- imagine the most serious act you want- serious, very serious and with a confession you are already covered. If it weren’t so dramatic it would be humorous to approach that topic, because during the confession they don’t even deposit a cent. It would be - like one says commonly in your world- "to pull the Father’s leg" obviously you would believe that you are deceiving him, but in the end all the karma is yours; then it wouldn’t be a deceit. In the same way there are spiritual entities who don't accumulate hostile acts in one life, they accumulate hostile acts in thousands of lives because their spirits enjoy those egotistical roles of power, of subjection, or their 10%’s enjoy those victim roles that allow them to manipulate permanently to others and as Johnakan said in many occasions, they don’t even want to go ahead because they find themselves absolutely comfortable in that situation being manipulative. Interlocutor: Yes, I would add that they even say that the Masters of Light are plotting against them. I have listened to that! Interlocutor: They say they are calm and they don’t need of anybody, or they don’t need any help. Morganel: ...it would be like admitting that indeed they would need it. Interlocutor: And of course that’s impossible due to the condition in which they are. Morganel: That’s right, but without being a fortune-teller - because neither you nor I am fortune-teller in the superphysical plane - but we can visualize the march of humanity, of several humanities in different worlds and we know that there are exceptional beings, we know that there are beings who enjoy helping others and they stretch a hand out, we know that there are beings who enjoy and don't stretch a hand out to help others, some for not committing, others do not want to have inconveniences, they are not cruel spirits, they simply want to be in harmony but they have a mistaken vision of what harmony is, because harmony without commitment is a false harmony; and there are spirits who directly live obstructing the march, they live blocking through hostile acts, manipulating, or whatever it is, and they repeat in each life similar roles. I have sometimes "visualized"- or rather grasped- in the mind of many incarnated beings questions, many questions like, for example: "Why would I worry now, if in thousands of millions of years I will be merged with the Creator too?" Interlocutor: Yes, I have heard that, but I don't believe that the thing is like that. Morganel: The answer is: "Yes, they will be merged with the Creator" but there are two objections: The first is that they will not be merged with the same qualities compared to others who lived to serve, and the second – which will be a question- Wouldn’t it be more beautiful to spend the physical life here, helping others instead of being inactive only surviving and adding more karmas to their lives and decreasing of level? The ego never takes responsibility, the ego doesn't commit, the ego acts; after all, it’s a role but - as Johnakan said it many times - that role is not independent from the being, it is not independent from the incarnated part, it is not independent from the spirit, it is the spirit! It is the incarnated part that plays a role, but it is the spirit. If it were understood that the ego is an independent role, the person, the embodied being would take that as an excuse to wash his hands even more. No, the role in fact doesn't exist; it is the person's representation. We call it ego. It shows several aspects, arrogant facets, because those who go to spiritual schools think that the ego is the arrogant facet; "That egotistic, arrogant individual" and they forget - and Johnakan already explained - that there are roles of ego absolutely fearful with a tremendous low self-esteem, they transform the person in a coward, incapable to take chances. Little do they know of the egotistical facets, but they are not differentiated from the person; it’s the same person the one who plays those roles as though the person were an actor. And many thousands of years can pass, and millions of years can pass and there are spirits who will keep committing hostile acts. Now, let’s use coherence, let’s use the common sense, why lacking little for the Big-Crunch to come will they reflect? What will make them reflect if Free Will exists until the end of times? Then, they won't reach it with the same vibration, those who have served from the beginning to the end of the universe, compared to other spirits who have realized in the last hundreds of years that they had thousands of wasted lives. I find it perfect if they realize that, but the merit will be different because the person who served in a bigger proportion compared to the hostile acts he have committed will have that hypothetical bank account in positive numbers and he will keep depositing for the pleasure to serve; not because he has a debt. However, those who have withdrawn from that bank account during thousands and thousands of millions of years and suddenly they deposit some cents, they won't have the same merit. They will merge somehow with the Creator, but they won't have the same merit, they won't have the same quality. For that reason, it is important to use common sense, to use coherence when one speaks of situations that can be little understood. There are many things we still ignore - I include myself - but exactly for that reason I have that desire to investigate. The investigative desire is because I have the desire to know, the eagerness to know. As a spirit, it doesn't bring me any interest more than the joy of being able to have more knowledge and be able to be more useful to others. It is as if some of you in the profession, whichever it was, were better trained, you all had a bigger knowledge, you were better professors, better surgeons, better carpenters and you all made it with love, as if it were a master piece. Then the eagerness of any Spirit of Light, worthy of its salt, is to do service as if it were a master piece with the exception of understanding that we are limited and that we are fallible. Even reaching the highest grade, we are fallible. As long as we understand that, we will always understand that we must be humble because the fact of incorporating in our concept that we have the possibility to make mistakes permanently makes us humble. However, repeating what the Master Ruanel said in another communication, he who is conformist, it is not useful, it is not useful he who takes the chicken of the golden eggs and for that tremendous greediness opens the hen up thinking that he will have a mountain of gold and he is left without anything. Well, since he has that golden egg, which is good for his physical life. And what about the spiritual life? Which is the real life! What is he sowing In the spiritual life? Sufficiency, conformism? In the long run it becomes in lassitude because there is no growth, because there is a factory of golden eggs, but those hens need corn to survive; not to open them up, which is something that most of the therapists regrettably are doing and every time, I perceive that they are more. And they are counted with the fingers of your hand those who give corn to the hens so that they have chickens and in turn they have hens with more golden eggs-figuratively speaking-. But no, they don't have the capacity - I correct myself – they are not interested in having the capacity to grow up and to feed new hens they feel satisfied with taking out a golden egg and later on kill the hen because with that egg they survive. But they don't grow, they stay there. And tomorrow's day there will be new possibilities and that factory will no longer be useful and those who had the possibility to have new hens and build more modern factories, but they didn't build them and within centuries that factory will be buried in oblivion because instead of making the hens grow up, they opened them up. Interlocutor: And that has been happening here throughout our history in Sun 3. It is remarkable. Interlocutor: Yes, exactly I was thinking that. Morganel: ...There where they open the hens up because the ideal thing is when several beings see that there is a heavy chariot and they take the reins and they start pulling the chariot, they don’t go inside the chariot. Johnakan transmitted to me a while ago that there are spiritual schools that already have more than a century and their followers compete in order to see who is served instead of competing to serve others; esoteric schools where they teach deterioration, schools where they teach what was taught in different ages on this planet, when they wear the boot and the other shines that boot, metaphorically speaking. And in several schools one sees as much or more meanness in that ordinary people who directly don't commit with anything. It is true. That people are indifferent and that is not good, because the sublime Master said that indifference is the enemy of Love and not hatred. However if to that indifference you add the desire to personalize and take out fruits although they are small and with that fruits you are satisfied and you don’t grow up, you create karma to yourself because you are not even taking care of your own hen. And what it is much worse, if you have many chickens - in many minds I perceive "How easy it would be to open the hen up, the hen that breeds chickens! "- And if the chickens ate only grains of gold they would not even have to feed themselves conceptually and they would succumb spiritually. Do you understand what I mean? Every day we are more connected to such point than you practically perceive what I think, dear Manuel. Interlocutor: Yes, in these moments I confirm it, I perceive much better many things you have said, things that you were exposing in these sessions. They are concepts that I believed were only mine and I’m already seeing that they are... shared. Interlocutor: I ratify that. Yes. Interlocutor: Yes, I’m seeing that conformism. Yes. Interlocutor: Yes, not only do they laugh secretly at me, they laugh at my face openly; it has happened to me. Several times. Morganel: I know that. I know because we are one. Morganel: In the case of this vessel maybe they are not laughing at his face, but they think that the investigation is an action - I don't say superfluous - but it doesn't have the same connotation of commitment like other types of service, and that shows the difficulty that many have to understand what the true service is and how many facets of service there are. Even more - to conclude - there are as many facets of service as ego facets they have, with a great and notorious difference; the facets of service can be seen one after another, the facets of the ego don’t because they are camouflaged, they hide, they disguise and even they are dangerous because they can be disguised as service. And you know that, you have thought about it because I am part of you and I know that you have thought about it. Interlocutor: Yes, I have thought it. Yes. Morganel: Obviously you have. We are one. And that’s the proof that what I say is real, because I could say many more things to bear testimony that we are one. But it doesn't make sense in this session because I wanted to state undoubtedly that many beings not only need that injection of commitment, but also a desire to grow up. Growing is not only to be devoted to a function and to be stuck in that function because as well as there are beings in the physical plane that work at an office and they begin from below, maybe carrying papers and they make a career, in the spiritual plane the same thing happens; but there is not an economic ambition, there is not an ambition of power, it’s the eagerness to serve and as much as one knows the simpler will be for him to be useful to the other. Interlocutor: They feel happy with that. Morganel: ...they feel conformist, with the added problem - and with this I finish and surely this is the most important thing of all- there are so many who stretch the hand out to help others and when a conformist shakes hands with them, those who shake hands with the conformist feel that conformist's vibration and they think that the whole factory is conformist. And that is the serious issue, because the factory wants to keep growing. And finally the conformists not only don’t make the factory grow, but rather they are ballast bags. Interlocutor: Yes, they are those who obstruct the march. Morganel: Then, sometimes the train has to be detached from some wagons. I hope that each mental decoder’s understanding do not take me as an intolerant spirit. Morganel spoke to you. Interlocutor: Thank you, Morganel. Thank you for your messages. This entry was posted at Friday, January 07, 2011 and is filed under Concepts, Morganel . You can follow any responses to this entry through the .